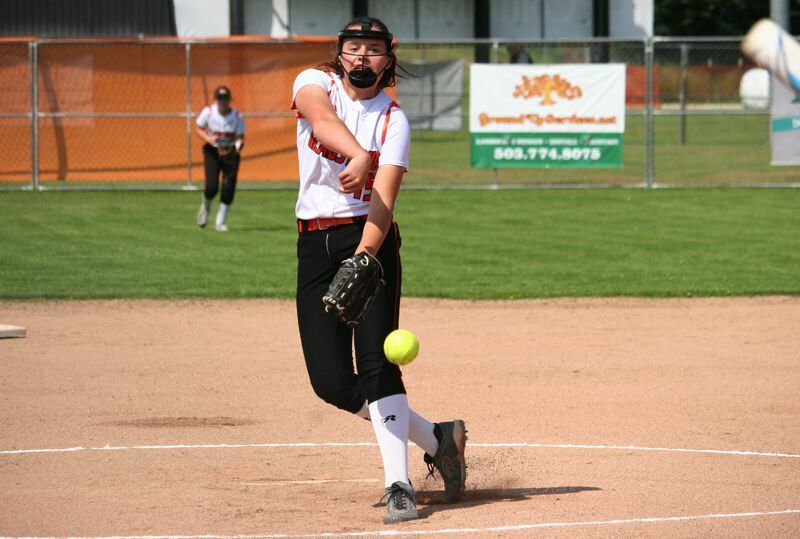 Gladstone's Shaye Pinner fired a two-hitter with 14 strikeouts, leading the Gladiators to a 10-2 home win over the Elmira Falcons in Wednesday opening round of the OSAA Class 4A softball playoffs. Laila Bennett went 4 for 4 with a double and four RBIs, highlighting a 13-hit attack that helped lift the No. 8-ranked Gladiators (22-5) into Friday's quarterfinals against top-ranked La Grande (20-4). "It feels pretty good going into the quarterfinals," Pinner said. "We all kind of know now that if we play the game we know how to play and do everything that we can to help our team, we can go pretty far in the playoffs." Gladstone went into Wednesday's game riding a 17-game win streak and jumped on Elmira starter Kylee Anderson in the first inning, turning a walk, three singles, and a double into a 3-0 lead. Sabrina Ward led off with a walk, Dessie Alvarado followed with a bunt single, and Maddie Brady added a single that scored Ward with the game's first run. Emily Clinkscales then hit an RBI-groundout to second that scored Alvarado, and Bennett lashed a double to left that scored Brady to make it 3-0. "I felt like we were all pretty nervous going into the game," Pinner said. "Then when we went and got those runs in the first inning, it opened our eyes to like, 'OK, we can do this. Let's keep pushing and see how far we can take it.'" Gladstone added three runs in the third inning and two more in the fourth to extend the lead to 8-0 and all but put the game out of reach, considering how well Pinner was throwing. The senior right-hander struck out nine of the first 12 Elmira batters she faced and took a one-hit shutout into the fifth when the Falcons finally got on the scoreboard. Courtney Haffner led off Elmira's fifth with a double, advanced to third on Taylor Dorsey's flyout to right, and scored on Paige Reichenberger's sacrifice bunt that the Gladiators played into an error. After Gladstone scored two runs in the sixth to make it 10-1, the Falcons got a run in the seventh on an error, a fielder's choice, a walk, and an RBI-groundout. Elmira had runners at second and third when the game ended on a strikeout. "I was throwing it like any other game," Pinner said. "Elmira had some good batters, but I was just trying to do my job. All I could do was put the ball in there and if they got ahold of it, my team took care of it." Sarah Stout had a one-out single in the second inning for Elmira's first hit of the game, and the only other hit was Haffner's double leading off the fifth for the Falcons (21-7).